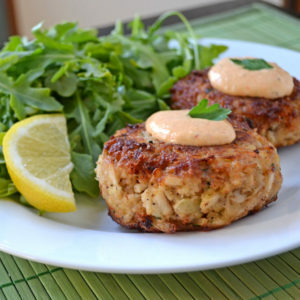 These Summer crab cakes are as easy as 1-2-3. Whether you serve them for brunch, as a starter, or as the star of your dinner menu, these crab cakes are nothing short of happy-making. Don’t forget to serve a bit of sriracha mayo on the side! Lightly mix all ingredients together in a bowl. Form into 4 oz. patties. Lightly coat the patties in seasoned bread crumbs. Saute crab cakes in vegetable oil until golden brown. I love to serve my crab cakes with baby roasted potatoes and an arugula salad. Here’s the recipe for my favorite sriracha mayo. “Spill the Tea” is a refreshing India Pale Lager brewed with green tea and citrus peel, which will pair beautifully with crab cakes! The subtle green tea and more prominent citrus peel will bring out the delicate flavor of the crab without overpowering it and the hops will stand up to the Siracha mayo. “Spill the Tea” is collaboration between Jacks Abbey, a Massachusetts brewery that specializes in lagers, and a persona favorite, Finback Brewery from Queens.